Business owners know that transportation is an important factor in an area’s economic climate. For many years, DCEDC has taken the lead to improve the local transportation infrastructure. The Wisconsin Department of Transportation completed two major projects in Door County in 2008. 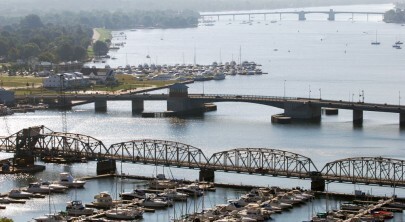 In September, Sturgeon Bay celebrated the opening of the new $32 Million channel bridge crossing, connecting Maple and Oregon Streets. In October, the County opened the final section of State Highway 57 as a four-lane divided highway, allowing for uninterrupted travel from Green Bay to Sturgeon Bay. The $72 Million four lane highway project and the Maple-Oregon bridge will dramatically improve the transportation infrastructure in Door County, enhance public safety and improve accessibility of the county for all sectors of the local economy. DCEDC was at the forefront of advocacy for both of these projects, dating back to the organization’s founding in 1989. View a summary of recent transportation initiatives.